I didn't get enough driving on the Autobahns yesterday, so I accompanied Charles on a 3+ hour drive across Germany to near Frankfurt to pick up Jeanne's mare Elana, who'd been bred to the Arabian stallion Ganimed. He's standing at Classic Performance Stallions, owned by Urte Kern and Jost Appel. 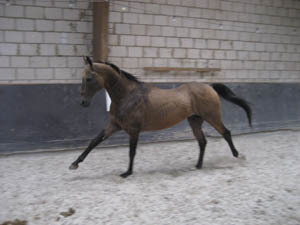 Ganimed was a very successful racehorse, and also performed well in dressage and jumping. Jeanne and Charles searched far and wide till they found this horse, who fit the bill of just like what they were looking for in a stallion for an endurance mare. Up until recently Urte and Jost had a rather large collection of horses – dressage horses, jumpers, eventers, a few endurance horses; stallions, mares, foals, and every age in between; Arabians, Thoroughbreds, Anglo-Arabians, the Akhal-Teke, and the Akhal-Teke – Arabian cross. The Akhal-Teke comes from Russia where they are used for flat racing. 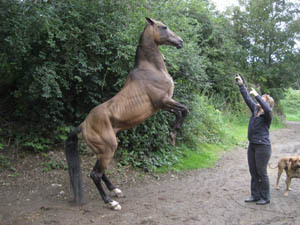 They have a reputation of being tough horses – if they survive the conditions getting to the races, and they then survive their racing careers, they are indeed a strong horse. Over the last few years, Urte had been frustrated by the registries snubbing the Akhal-Teke – Arabian cross; the standards said the horse had to look a certain showy way, decided by people who only want looks and nothing practical that would be useful as a performance horse. In fact, they seemed to be afraid of the performance horse, wanting only the ornamantal show horse. And so, a year ago, Urte and Jost decided to start their own breed with the Akhal-Teke and Arabian cross: the Arasier (sometimes you'll see it as Arasien). They've established their own guidelines for the breed, which are based on half-Arabian sport horse standards. It's not limited to looks, or size, or color. Urte was happy to show us her horses, talking extensively about each one of them. The Akhal-Teke breed is quite distinctive. 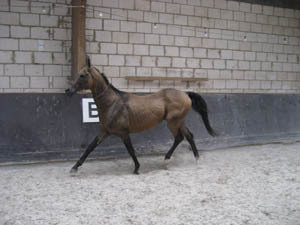 A golden coat is very typical of (though not exclusive in) the breed, as is their build: very angular, defined muscles, long back, distinctive neck, high head carriage, amazing floating extended natural trot, very light canter. Urte said they all have great temperaments, are very calm, obedient, and very versatile – all their Akhal-Tekes have excelled at dressage, and jumping, and some have shown promise at endurance. 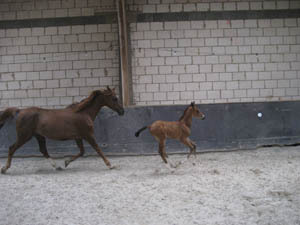 The movement of all of them, even the month-old Arasier foal was outstanding – some horses you train for years and never get that extended trot, and these horses all did it naturally. In their stalls, Urte showed us their 3 Akhal Teke mares, all of the same typical golden color; this year due to circumstances beyond their control, all 3 mares unfortunately did not have foals. Also in stalls she showed us a beautiful black Anglo-Arabian stallion, Neesahn; since they've decided to concentrate on the Arasier breed, he doesn't fit in with their program anymore. But he was such a successful dressage and jumping horse, and has passed on his genes so successfully – and has been a part of the family for so many years – it's hard to think about selling him. He was a beauty – the big solid Thoroughbred-type horse I love to look at, and a knock-out black color to boot. Urte then brought into the indoor arena several horses to look at, to watch them move about freely. 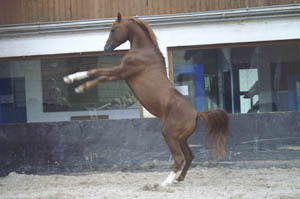 First was the chestnut stallion Ganimed, a fine specimen of the Arabian breed. Ganimed was a very successful flat racing horse, and his sire Drakon was also a successful racehorse and has produced a number of successful endurance horses in Germany. 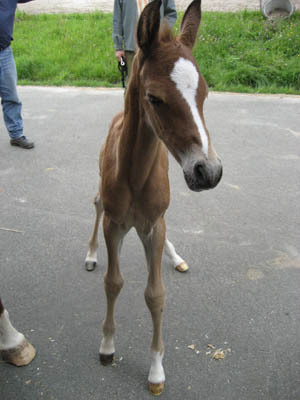 Next was an Arabian mare with her Arasier foal (the stallion an Akhal Teke) named Eurowings. 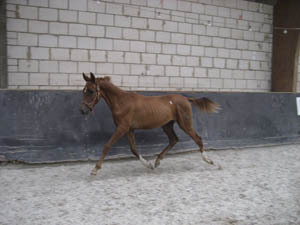 Already, at one month old, he looked like an Akhal Teke, with that characteristic high head carriage, unique neck shape, defined muscles, and that amazing floating extended trot. Next was a yearling Akhal-Teke colt who floated around the arena; then we looked at a few more Akhal-Tekes or Arasiers outside. You can see the passion in the eyes of Urte and Jost about these horses. Like David Marshall and Sandie Maclean in New Zealand with their Straight Egyptians: they are passionate about breeding these horses, they believe in them. They can recite every horse in the pedigree for 3 generations and what they've done and who they're related to and their eyes light up when they're talking about them. You can't help but feel that with such dedication, they will be successful.